It's a joy to have a new baby boy in the house. 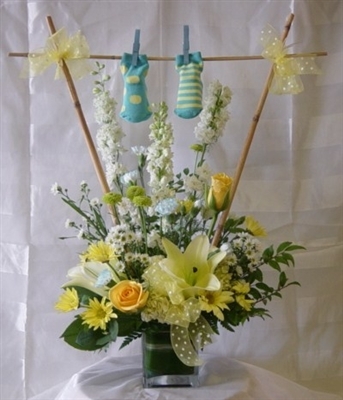 Make sure his little feet are covered with the cute booties included with this unique flower arrangement. This adorable bouquet includes yellow roses, lilies, white larkspur, white carnations & yellow daisies in a yellow & white theme.